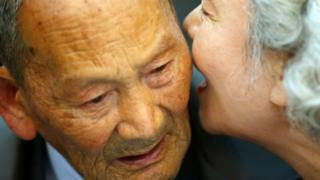 North and South Korea have agreed to resume reunions for families who were separated when the Korean War sealed the border between two nations. Millions were separated from loved ones by the 1950-1953 conflict, with many dying before they could be reunited. The reunion, to be held in August, will be the first since October 2015, and comes amid a thaw in diplomatic relations on the Korean peninsula. The resumption of the events was agreed at an April summit between the Koreas. Officials from North and South then met on Friday at Mount Kumgang resort in the North and set a date for late August. "The reunion will be held from August 20 to 26, and 100 participants will be selected from each side," said a joint statement. The lucky few are just a fraction of the 57,000 people registered with the South Korean Red Cross who are separated from family members. The 200 people who will go to the reunion will have just three days to catch up before they return to their respective sides of the border, knowing that they will in all likelihood not see those family members again. In South Korea, hopeful participants are picked at random by a computer which takes into account their age and family background. They also sit for interviews and take medical examinations to determine if they are fit to travel. Will historic talks lead to lasting peace? The previous reunion, in 2015, was more expansive, allowing 650 South Koreans to visit relatives in the North. North Korea has previously used the reunions for political ends, demanding the return of defectors in return, or cancelling the events at the last minute. The leader of North Korea, Kim Jong-un, met his South Korean counterpart Moon Jae-in in May in a surprise bilateral summit on the border between the two countries. The meeting was only the second between the two leaders. South Korea has taken an active role in trying to broker peace between the nations, and between North Korea and the US. Mr Kim met US President Donald Trump earlier this month - an unprecedented summit after a year in which the pair exchanged insults and threats.